You’re probably wondering “how good is Ranma ½ series three?”. The answer is quite simple: it’s so good that I watched fifteen episodes in one day so that I could get it out of the way and move onto something else. Yes, the law of diminishing returns strikes at last! I could say that every episode of this show is the same, but that’s not quite true, and it’s not quite the problem. Given that I enjoy the likes of City Hunter, it’s not really a complaint that I can get away with. No, the repetition of Ranma ½ is infinitely more sinister, rendering each episode into a black hole from which a few laughs may escape, but from which no meaning can be gleaned. With the introduction of one new character and the dropping of any continuous stories, Ranma ½ season three disappoints on all fronts. Ah, you step away from consistently watching anime for a long time, you come out, and then all of a sudden you’re confronted by how blatantly sexist everything is. A woman needs a husband! To serve and protect! Girls are incapable of making any decisions for themselves! In Ranma ½, we’re presented with two strong and independent leads … and a bunch of people around them who propagate a whole lot of senseless “women’s role” malarkey. All of the people who talk this way are generally presented as laughable idiots, but it does seem to be the party line of the series. 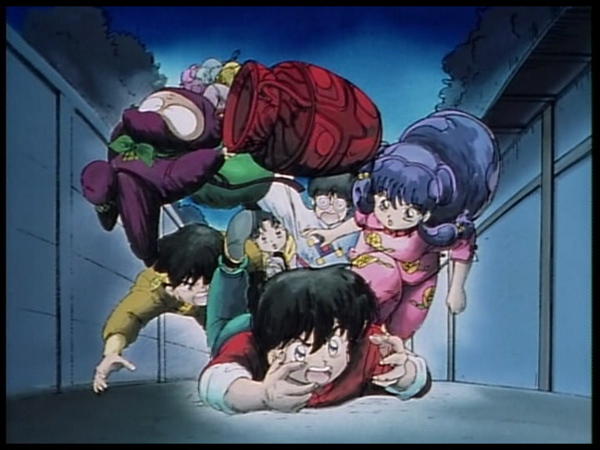 I hadn’t watched any Ranma ½ since October of last year, but it all came back to me … and the second series is funnier than the first despite some continuity I couldn’t quite place and Viz’s blatant and nonsensical rearrangement of the first twelve episodes. Ranma ½: one of the holy grails of nineties anime fandom. That’s the period of holy grails I tend to be most interested in, quite possibly because I had the means to read about anime for about six years before I had the means to watch it. Many people will cry out with the law of diminishing returns, but, I will argue, there can be no return more diminished than the sequels to Project A-Ko. The reason that I liked the first season of Ranma ½ as much as I did was because it had that charming earnestness that was the hallmark of several titles of the era. My only real problem is that this first series is somewhat insubstantial, but the existence of six other series soothes that to a small degree. Of course there is always the possibility that rather than substance being added to the insubstantial, Ranma ½ snowballs into an avalanche of the insubstantial. Naturally, I will reserve judgement until a later date. For instance, there are still many characters to be introduced.